The head coach wasn’t concerned by the delay between Ireland’s first and second tries during a sustained period of pressure. FOUR TRIES, A return to form and complete dominance when the contest was up for decision, the overriding mood from Joe Schmidt after Ireland’s win over France was a positive one. However, even the most apparently-perfect victories under Schmidt have been swiftly followed by a list of work-ons and his infamous reviews. So there was no doubt the Kiwi had a few black marks to hand out after France put a deceptive slant on the final scoreline with two late tries. “You’re up against a good French side, they needed to get something out of the game,” said Schmidt, perhaps a little irked that the early questions honed in on the negative side of the 80 minutes. You would imagine he will have plenty more to say about the concessions behind closed doors when the Championship is fully in the books. There were tries left begging too. While pinning France in their own half and putting up an unbelievable 90% territory up on the half-time stats board, Schmidt’s attack had to show a high degree of patience in their play with near-misses and decent French defence maintaining a one-score game until Jonathan Sexton ended his three-and-a-half year wait for a Test try and tilted the match irrevocably Ireland’s way. The big miss in the second half, in Schmidt’s eyes, was down to an officiating call as he points to a scrum lost against the head - ”it looked like the ball came out of the tunnel” – after the visitors had been hit with a sin-binning. 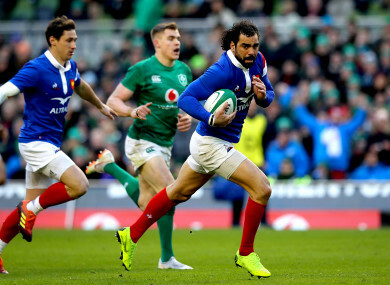 “Look there are always frustrations,” said the Kiwi looking back on first-half knock-ons from Garry Ringrose and Cian Healy that were more down to a deficiency of luck than skill. “Garry Ringrose might score that 10 times over. (After taking the high ball) he just tried to promote the ball with his left arm. If he just stays there, he’s going to slide over. Four tries on the board and a few more left behind. Schmidt will be glad to be back picking nits after a good, cohesive and successful performance after an uncomfortable five weeks. Email “Late lapse the chief disappointment for Schmidt”. Feedback on “Late lapse the chief disappointment for Schmidt”.